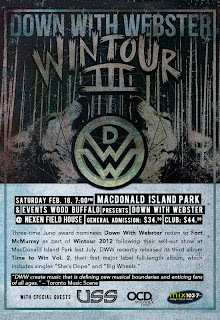 McMurray Musings: WinterPLAY Begins Tomorrow! Well, the brochure and website have been out for a bit now, but have you seen them? 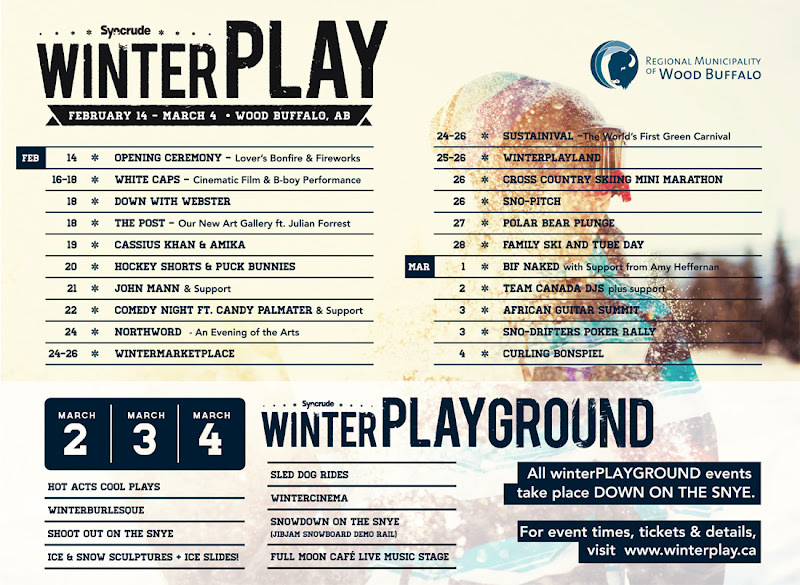 If not you need to take a look, because WinterPLAY starts tomorrow - and it's promising to be an incredible event in Fort McMurray. Running from February 14th - March 4th it's jam-packed with activities. Some are going to be quite unusual for this community, and definitely worth checking out. The good folks at Events Wood Buffalo have some real treats planned for our community, and I'm pretty excited about several of them. The first thing on the agenda is the opening ceremony being held tomorrow night at MacDonald Island Park on the Miskanaw Golf Course. 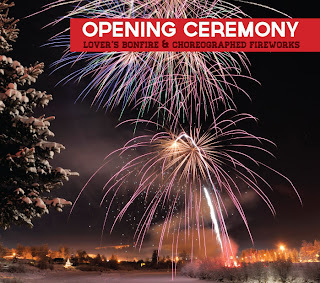 It's being billed as an evening of "sparks", with a lover's bonfire, fireworks, and an act called the Firestorm Troupe. Sounds like the perfect way to warm up a chilly winter evening, doesn't it? The festivities get under way at 7 pm, and while the official ceremonies conclude at 8 the bonfire and skating will continue until 10 pm. "White Caps" is playing at the Suncor Energy Centre for the Performing Arts February 16-18 at 8 pm, and for only $35 I think it's a must-see. 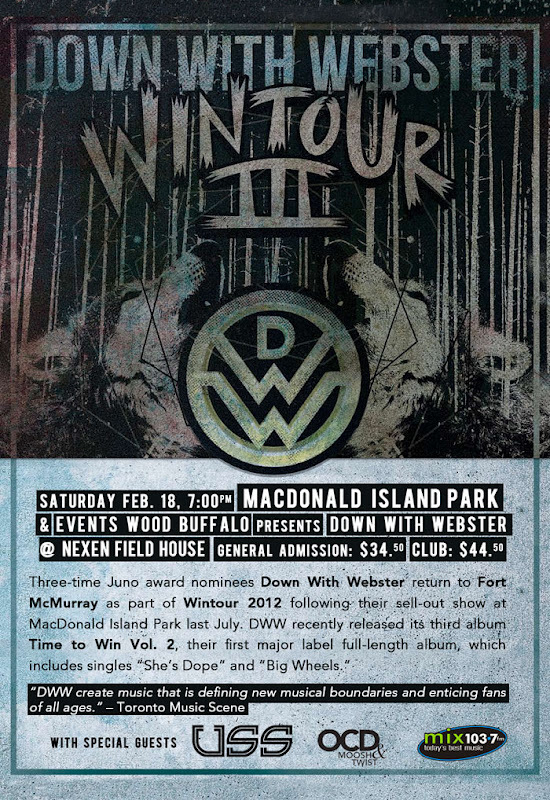 Then on Saturday February 18th is the concert the Intrepid Junior Bloggers have been excited about for weeks - Down With Webster at the Nexen Field House at MacDonald Island Park. They've been talking about it for weeks, too, and I'm thinking the show will easily surpass the previous show they played here last summer. So, that's just three events that I am pretty excited about - and there happens to be several more, too. 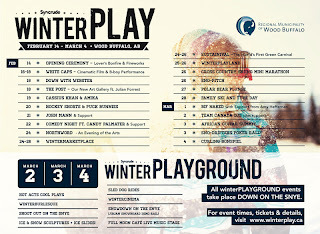 If you haven't checked out what is happening then see this calendar to see what is happening, and be sure to visit the WinterPLAY website for comprehensive information and ticket sales. I don't know about you, people, but I'm really looking forward to the next three weeks in this community - and I hope to see you tomorrow night around the bonfire!